All of my trips have been work related and while I am very much looking forward to some vacation time in the near future, I feel blessed with jobs that have taken me to amazing places, near and far. 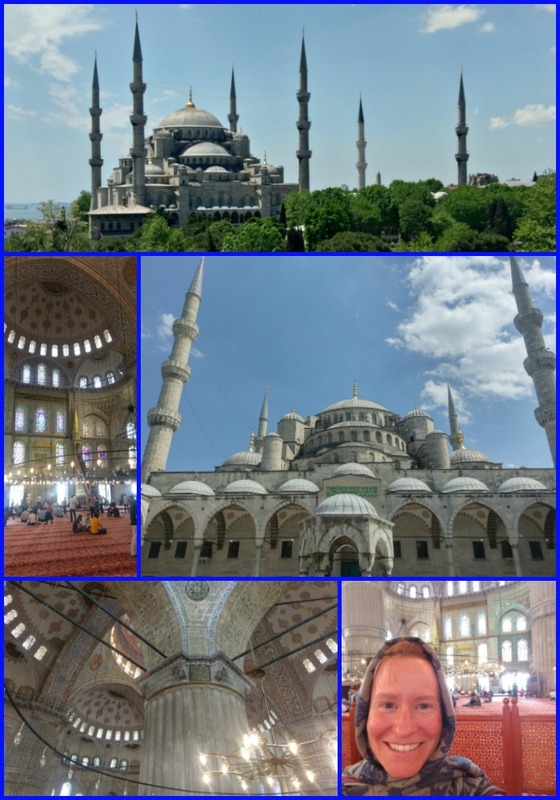 My current trip is especially exciting because I can't say that Turkey had been high on my list of places I was planning on going, but it has been an incredible trip so far. I am here to speak at a conference about smart and connected cities (yes, I know I'm a nerd), and today I had the chance to explore part of the old city with a colleague. 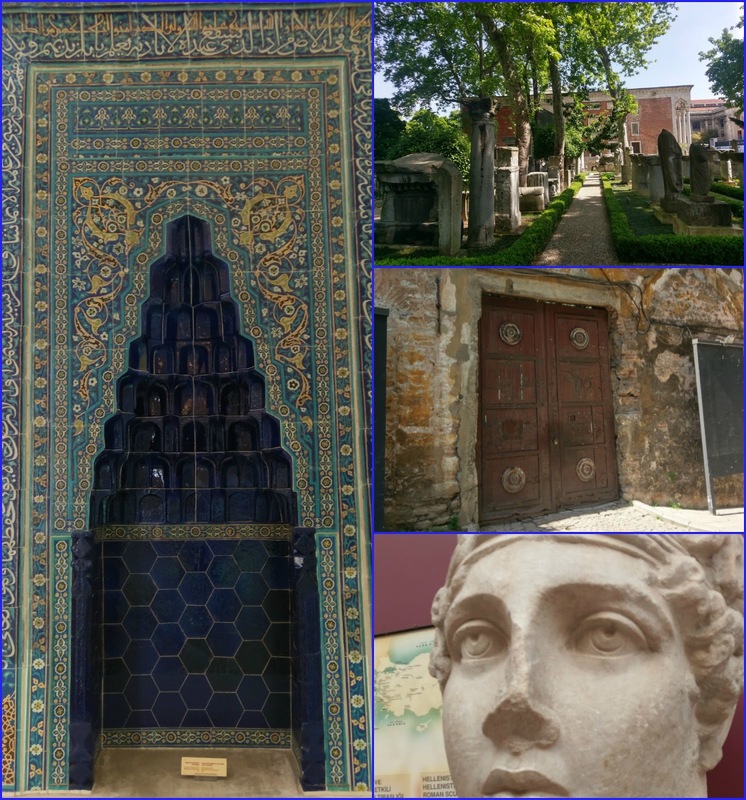 After taking a taxi and walking past shops with towers of Turkish Delight, we started at the Istanbul Archeology Museum, which is made up of three buildings. The ceramic tiles (left) were my favorite, but the statues, columns and outside features were beautiful too. It was hard to believe how old many of the artifacts were, dating back as far as 4100 BC. While the inside of the Hagia Sophia is wonderful, the scaffolding, throngs of people and light going every which way wasn't, making it difficult to get a photo worth sharing. 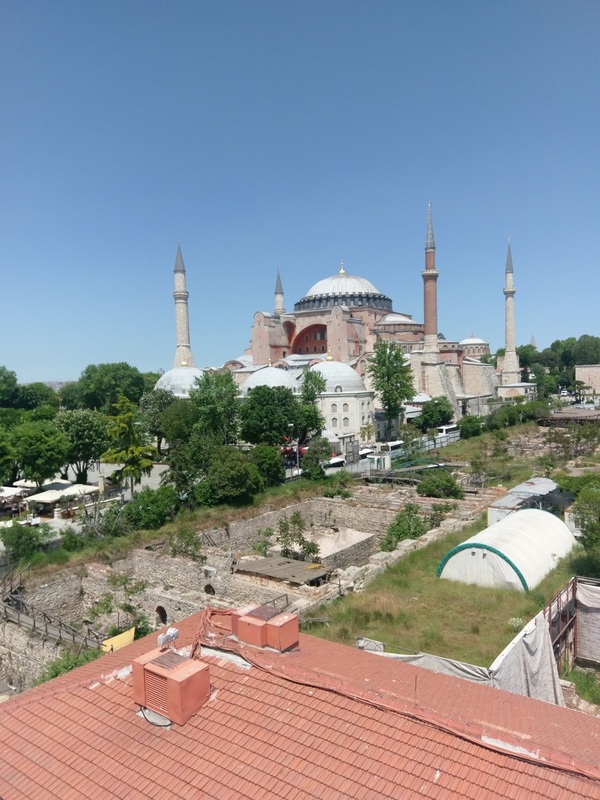 I would highly suggest clicking on the link to see the inside of this former Greek Orthodox Christian patriarchal basilica, which was later an imperial mosque, and is now a museum. 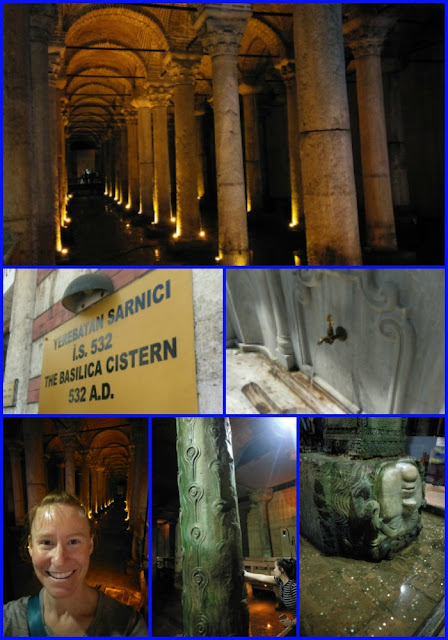 Across from the Hagia Sofia, is largest of the hundreds of underground cisterns that used to supply the city with water, the Basilica Cistern. This underground marvel was renovated in the 80's and is still being worked on. The "crying pillar" (center, bottom) had a hole in it that people kept sticking their thumb into and moving their hand in a clockwise motion. Since I didn't have time to look it up, I didn't want to do more harm than good and skipped it for now. I also liked the upside-down ancient Roman Medusa head at the base of a column. The Blue Mosque, or Sultan Ahmed Mosque, is still an active mosque, hence my headscarf. The architecture, history and beauty of this mosque, built starting in 1618, is really something to behold. After the mosque, a man who had following us, giving us hints about where to go, waited for us at the door. He wanted us to come see his shop. And while it felt a little like "don't fall for buying the frying pan at the home show," it was a pretty special experience we couldn't have planned. The main salesman had grown up in the U.S., his father a skilled tailor (in Rochester, NY no less!). He'd moved to Ohio and Jersey and a few places in between. 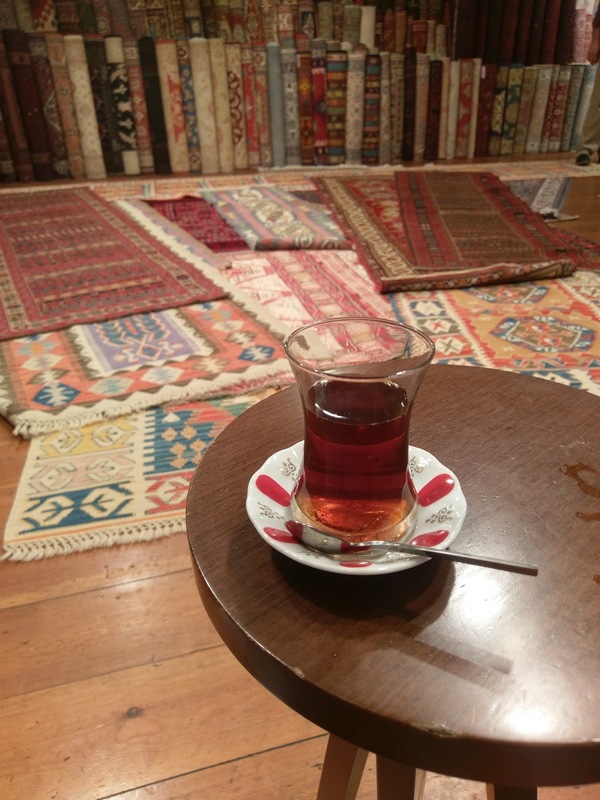 The shop was run by his family who were from Southeastern Turkey. Amid rugs, tea made by a young Syrian refugee man, discussions about world politics, and ornate craftsmanship, we were won over and left with rugs --because you never know when you'll be back! I'll share the rest of the day with you tomorrow - I know, there's so much in one day!